Since I'm hanging back and delaying the drive for our move from North Florida to Virginia Beach because of that lil hussy Irene, I was trolling around and looking at prior books I read before I started blogging. As a fan of all books and movies that are creepy, this one jumped out in my memory and produced an immediate shudder of recognition. Now, I realize that most may remember the awful movie that came out, which carried along the same lines of other horror movies at the time such as "Hostel" and "Turista," (which in my humble opinion were pretty horrible), the film version of The Ruins did have a rare moment or two that were somewhat entertaining and checked the list on ultimate horror. For the most part, though, the movie is one to skip. The book, however, is quite different. 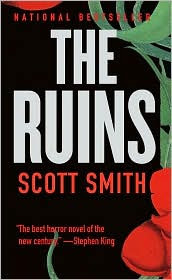 Although leading off with the standard recipe of vacationing tourists and an unknown terror, The Ruins by Scott Smith establishes a unique approach to the "regular" horror story and focuses more on the psychological aspect of fear. It is a book that pushes the reader to fully experience the characters' cycle of emotions encompassing tension, nervousness, questions, doubt, ultimate panic and fright, and not to mention loss of trust, which carries its own special blend of emotional turmoil. Four Americans traveling through Cancun, a vacation hot spot, meet a German tourist searching for his brother, who apparently took off with a female archaeologist to visit a Mayan ruin and hasn't been seen since. Deciding to travel with him, the team of five track down the Mayan ruin and are immediately accosted by the local Mexican villagers. Feeling threatened and not understanding the quickly spoken Spanish accompanied by shouts and guns, the five tourists find themselves inadvertently stepping into the area around the Mayan ruin. When they attempt to step forward, the locals are now pushing them back into it. Trapped, they can now only redirect back into the wooded area to escape. They soon discover that what they thought was the threat outside of the ruin was quite the opposite. The terror has just now begun. Creepy and downright frightening, The Ruins is one that will freak you out. Several events throughout the book are jarring solely for the fact that it is completely understandable how one could emotionally break down in that environment while facing the unknown. One scene in particular still makes me blanch with discomfort while my stomach turns over when I think about it. In my opinion, Scott Smith didn't write a horror story. He instead crafted a psychological thriller which incorporated elements of horror to provide a frighteningly unsettling story that compels the reader to continue reading each and every page with a tight grip. Highly recommended for those who want a really good scare to read, or for those who enjoy a good psychological thriller, and I'm pretty sure horror fans will approve as well. This is also one to put on the list if you are participating in Stainless Steel Dropping's annual RIP Challenge, which this year's challenge should be announced soon. I'm definitely joining in. 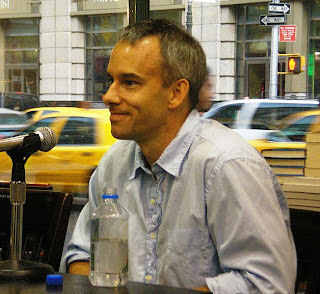 American author of The Ruins and A Simple Plan (and screenwriter for the film adaptation starring Bill Paxton and Billy Bob Thornton), Scott Smith has won numerous awards, along with an Academy Award nomination. Stephen King called The Ruins, "The best horror novel of the new century." Click here to visit the author on The Ruins official site. Click here to view or buy the book on Barnes and Noble. Click here to view or buy the book on Amazon.com. Click here to view or buy the book on Book Depository. I've not read this but I'm glad to hear it was better than the film. I really disliked the film when I saw it, despite it having one of my favorite actresses playing the lead. Granted, I'm not a huge fan of horor for th emost part. * "Granted, I'm not a huge fan of horror for the most part." Sorry for that. I hit "post" before seeing the error! I saw the movie. WEIRD! Didn't read the book. I read the book pre-blogging too and I loved it. Stephen King had actually recommended it, and of course I must obey him. Really a deliciously frightening read, but the movie? Eh, well, it would have been hard to do the book justice. I haven't read this, but I'll make sure Carl's in town if I ever do. I hope your move goes well! I loved this book. It was a fantastic page turner. I also liked the movie, too, though. 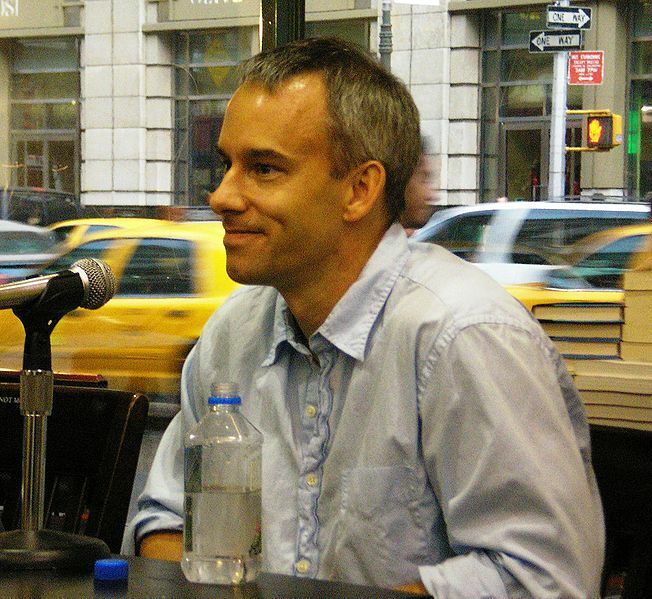 Scott Smith also wrote the screenplay. tediousandbrief - It was MUCH better than the film. I'd be curious to read your thoughts on it, if you get a chance to pick it up! Michelle (Red Headed Book Child) - Odd movie, but definitely read the book. So, so, SO CREEPY! bermudaonion - Yes, you must have company around when reading it. Scary scary! And thanks, I can't wait to get up to Va Beach! I haven't read this one. But I find psychological thrillers to be incredibly scary already. This sounds terrifying! When I was a teen I loved stuff like that but not so much now! Jenny - Ooh, you should try this one. I think you might like it! I read this when it first came out, but I thought it was just so so. That was several years ago. Hey, stay safe! Used to live in Va. Beach - hoping Irene shows some mercy! This sounds great, I love being really scared, but only when I'm safely snuggled on the couch reading! I'm especially interested in reading this now that I see he wrote A Simple Plan, I loved that film. Wishing you luck with Irene too! I haven't read the book or seen the movie, but I have had the book on my shelf for the longest time. I had seen some mixed reviews when I first went looking around, but your perceptions are interesting to me. I love a good scary story now and then, so I think I might try to pick this one up around Halloween this year. It seems like that would be a perfect time for this book! Fantastic review, Natalie! I am glad you liked this one so much!